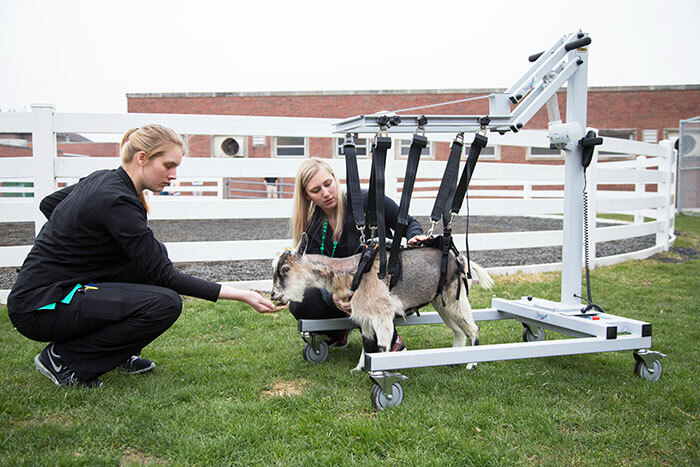 Marjorie the goat walks again with the help of a Litegait-V lift at the Purdue University College of Veterinary Medicine under the watchful care of Kristi Stough, extern in the Veterinary Teaching Hospital, and Jessica Bowditch, RVT, veterinary neurology/neurosurgery and physical rehabilitation technician, who were vital in helping Marjorie with her recovery from her complex and successful treatment. 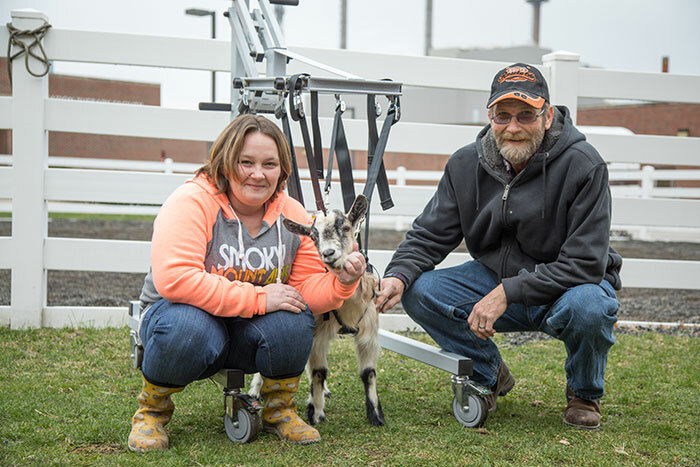 Marjorie, a one-year-old Pygmy goat, lived her happy life just as any other young goat on a large farm with her loving owners, Tasha and Ed Duoda, in Solsberry, Ind., located in Green County. Surrounded by other outgoing farm animals, such as ducks, chickens, cows, and geese, Marjorie was always able to play with a friend. However, one day earlier this year, Tasha and Ed noticed something was awry with their playful Marjorie. She had her head down in a strange angle, and could only walk a short distance. Later, they found her motionless on the ground. The Duodas decided to bring Marjorie to their regular veterinarian, who then referred them to Purdue Veterinary Medicine's Large Animal Hospital (LAH). The case was received by the Large Animal Internal Medicine service. Dr. Janice Kritchevsky, professor of large animal internal medicine and Dr. Gillian Haanen, large animal internal medicine resident, went right to work evaluating Marjorie and beginning the process of pulling together the team of experts who would help Marjorie walk again. The LAH is part of the College of Veterinary Medicine's Veterinary Teaching Hospital (VTH), and multiple hospital services got involved in a true team effort to treat Marjorie. "Marjorie's symptoms gave us a good indication that we would need a variety of specialists to determine the correct diagnosis and treatment plan," Dr. Kritchevsky said. "That's one of the benefits we offer through our Large and Small Animal Hospitals. We have clinicians in all of the major specialties who we can bring together to help with even the most complex cases. And that happens in a setting that also supports the education of our students, interns and residents." For Marjorie, Drs. Kritchevsky and Haanen arranged for the Diagnostic Imaging service to perform MRI and CT scans needed to diagnose Marjorie's condition. Because of the nature of her symptoms, Dr. Tim Lescun, associate professor of large animal surgery, and Dr. Tim Bentley, associate professor of neurology and neurosurgery, also were called on for their expertise. With the benefit of the MRI and CT scans, they diagnosed Marjorie with an atlanto-occipital luxation, also known as internal decapitation, which caused her to be paralyzed and unable to walk. The owners thought another goat may have butted Marjorie, causing the injury. Drs. Lescun and Bentley investigated the challenging situation further, viewing dog and sheep skulls and vertebrae to analyze the best approach to treatment. With the help of 3D reconstructions, Drs. Lescun and Bentley and their team prepared for surgery. More than a dozen people were involved in the surgery, from those providing anesthesia, to the surgeons and surgical technicians, and those working with the intraoperative radiographs. To correct the internal decapitation, Marjorie's first cervical vertebra (C1) had to be moved back into proper position. Drs. Lescun and Bentley did so with the help of transarticular screws that were placed in both the atlanto-occipital joints and the arch of C1. Then, they covered the whole construct in bone cement to hold everything together. After the challenging surgery was performed, Marjorie needed extensive aftercare provided by the Large Animal Internal Medicine service while the VTH's Physical Rehabilitation service, led by Dr. Stephanie Thomovsky, clinical associate professor of veterinary neurology, began the arduous process of rehabilitation and physical therapy. Soon, Marjorie was walking again with the help of a Litegait-V lift. Elisha Perrin, of the DVM Class of 2017, was the lead student on the case and worked very closely with Marjorie through every step of her difficult journey. She witnessed firsthand the teamwork between the Large Animal Internal Medicine, Large Animal Surgery, Neurology, Physical Rehabilitation and Anesthesiology services. "Watching Marjorie walk out of the hospital on her own was easily one of the most rewarding moments of my fourth year, and it wouldn't have been possible without the collaboration of all of those services," Elisha said. Marjorie went back home to her joyful farm life with the Duodas on March 24 and the couple reports she's doing well. Tasha and Ed Duoda, of Solsberry, Ind., pose with their beloved Marjorie. The couple reports that Marjorie has been doing well post-surgery. 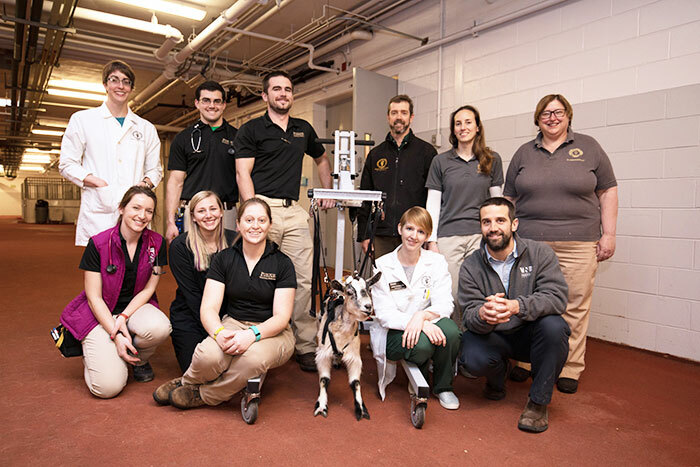 Team members involved in Marjorie's care pause for a photo op with the miracle goat before she is sent home. Front row (left-right): Ashleigh Cournoyer, DVM Class of 2017; Jessica Bowditch, RVT, veterinary neurology/neurosurgery and physical rehabilitation technician; Elisha Perrin, DVM Class of 2017; Dr. Lindsey Peterson, neurology resident; and Dr. Tim Bentley, associate professor of neurology & neurosurgery. Back row (left-right): Dr. Stephanie Thomovsky, clinical associate professor of veterinary neurology; Jim Chaille, DVM Class of 2017; Daniel Gascho, DVM Class of 2017; Dr. Tim Lescun, associate professor of large animal surgery; Dr. Gillian Haanen, large animal internal medicine resident; and Dr. Janice Kritchevsky, professor of large animal internal medicine.